Marble and granite countertops are two of the most popular materials in the countertop industry. 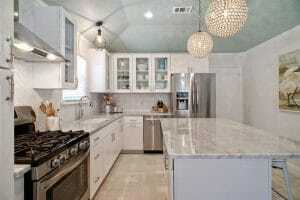 And although the latter seems to be the go-to option, there is a high demand for marble countertops in Tampa Bay. If you plan to install countertops in your home in the Tampa Bay area, then maybe you should consider marble countertops. Perhaps its benefits below will help you decide. The timeless, exquisite look of marble countertops is what separates it from the other natural stone countertop materials. The unassuming ‘brightness’ of marble brings an unrivaled elegance to any type of kitchen that will absolutely make a long-lasting impression. Highly recommended by kitchen designers and used in show homes, magazines, and luxury buildings, because there is nothing quite like the look of marble. Tampa Bay is home to many high-end homes, condos, and luxury apartments. The demand for marble is high. Fortunately, Tampa Bay Marble and Granite offers marble, quartzite, granite, and other in-demand natural stone materials. As a direct importer, we are able to bring exclusive and highly sought-after colors directly to the Tampa Bay area. Natural stones such as granite and marble are some of the most valuable improvements when it comes to kitchen and bathroom remodeling. They are rich in elegance that will elevate the feel and look of your home dramatically. This is particularly true in the kitchen, which the majority of people consider to be the centerpiece of their residence. With countertops being among the most visible things in the kitchen and bath areas, selecting a lovely material like marble to improve your home’s appeal, shouldn’t be underestimated. Although marble does require a bit a lot more maintenance than granite, it does not mean that it is not a long-lasting stone. Marble has actually been used as a building material for centuries due to its mix of strength and elegance. 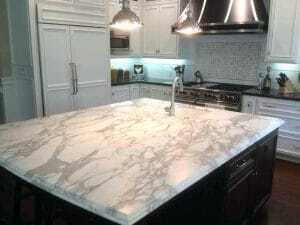 Several of the globe’s oldest and most distinguished sites have been created from marble for this reason in general, marble is a durable stone and is perfectly qualified in handling everyday kitchen use. With a little extra care, and basic preventive maintenance, it will last a lifetime. Still have questions about installing marble countertops in the Tampa Bay area? Give us a call and set up an appointment, or stop by during showroom hours. One of our associates will make sure that you are getting the best advice available.